Haunted School Tiles| RPG Maker | Create Your Own Game! Haunted School Tiles will take your players on a terrifying journey into a school brimming with sorrow, anguish and danger. Created by Sherman3D, this pack includes the essentials you'll need to create the inside of a Victorian-inspired school or mansion that's possessed by evil. 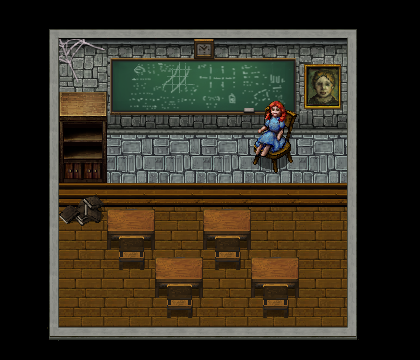 From altars and doll parts to blood-soaked floors, Haunted School Tiles is a great addition to your growing library of RPG Maker resources. Basics needed to create a haunted school or mansion. Student and teacher desks, blackboard, antique furniture suitable for horror games, thrillers and more.